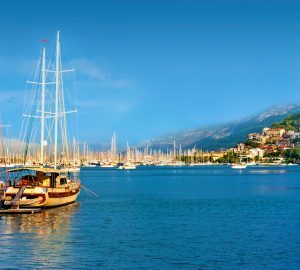 Luxury Turkish Gulet MEZCAL 2 was launched in 2012 by Yaz Gunesi Shipyard in Antalya. MEZCAL 2 measures 38m (124,5ft) and can accommodate 12 guests in 6 deluxe cabins. With her spacious layout and 7 bilingual crew, she offers superior service and ultimate relaxation to her guests in Turkey, Greece and Croatia. M/S MEZCAL 2 has a modern and stylish interior with fine wood floors and panels, crisp white soft furnishings and ample natural light throughout. The salon is spacious with panoramic windows, a large U shaped sofa, formal dining table and a 3D flat screen TV with over 2000 movies to choose from. Motor sailor MEZCAL 2 boasts fabulous deck areas, the aft deck is ideal for entertaining offering a shaded alfresco dining option, full wet bar with seating, massive full beam aft sunpad and generous deck space. Forward guests can relax on one of the many sunpads or take a dip in the Spa Pool tub. 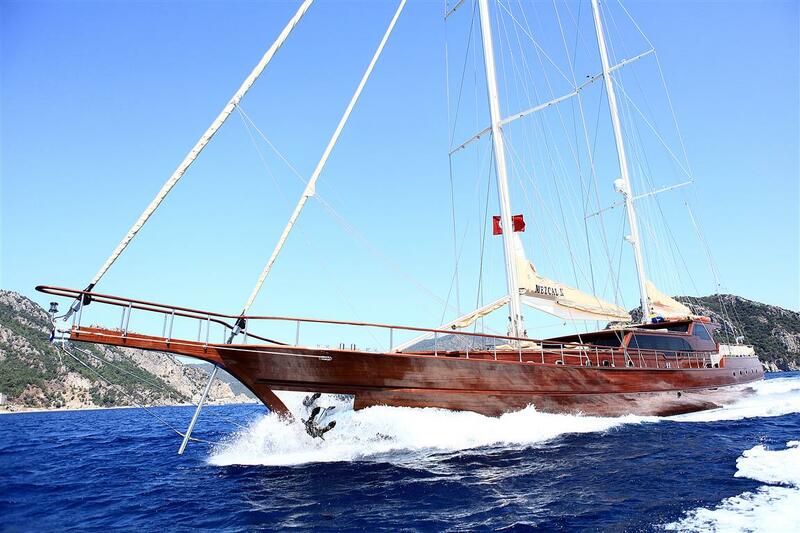 Luxury Turkish Gulet MEZCAL 2 is powered by 2 x 550 HP IVECO engines capable of speeds of up to 14.5 knots. 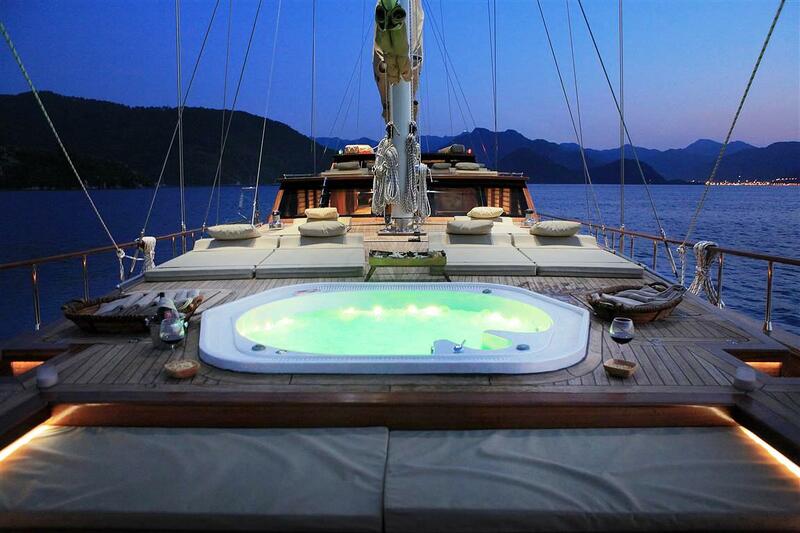 M/S MEZCAL 2 boasts a beam of 8.2m (26.10ft) making her a stable and comfortable yacht. Sailing yacht MEZCAL 2 accommodates 12 guests in 1 Master suite, 1 VIP cabin, 2 double and 2 twin cabins all of which are tastefully decorated in a minimalistic theme featuring warm woods and neutral tones. The Master suite is aft and full beam of the yacht with a king size bed, sofa and ample space. 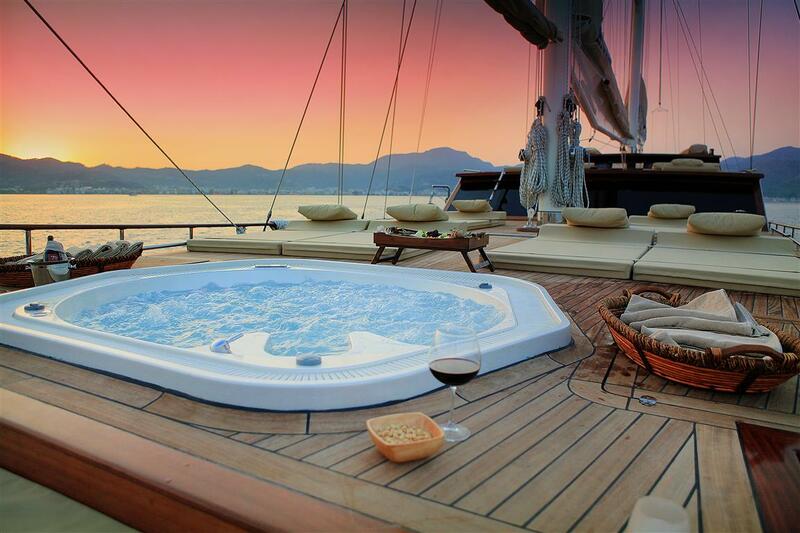 The VIP suite is forward and full beam of the yacht. A further 2 double cabins offer double beds and 2 twin cabins have 2 single beds each. All 6 cabins are en-suite and offer TV and stereo entertainment.